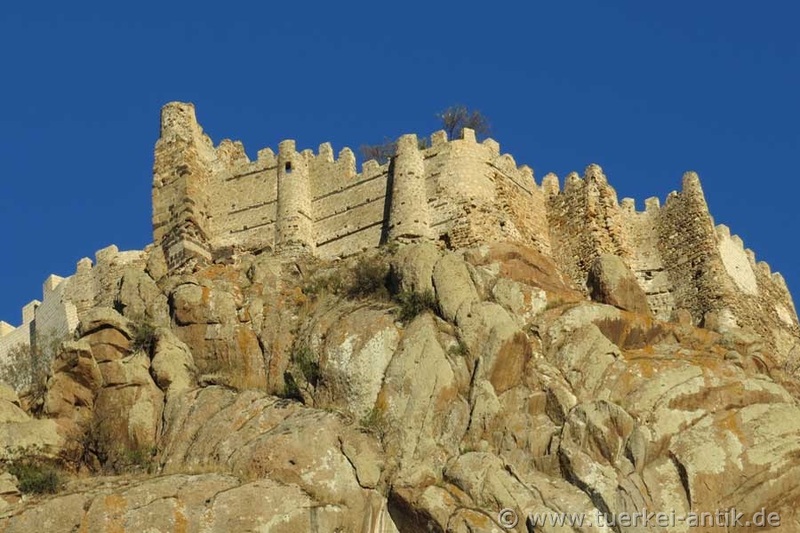 The castle of Afyonkarahisar (Turkish: Afyonkarahisar Kalesi) is a fortification built around 1350 BC by the Hittites on a 226 m high rock massif. The fortress is probably identical with the Hittite Hapanuwa, which belonged to the Arzawa countries and was occupied by Muršili II in the 14th century BC. A settlement in the Phrygian period is also documented. Little is known about the ancient history of the city. The name of the town that was built around the castle hill under Seljuk rule was Karahisar-ı Sahib, the "Black Castle of Sahib". This goes back to the Seldschuk vizier Sahip Ata, who had the castle repaired. The name Afyon comes from the time after the founding of the republic and is the Turkish word for opium. The city was called Akroinos or Akroinon in Roman and Byzantine times. Under the name Akroinos the town and fortress belonged to Pergamon, later to the Roman Empire and from 395 A.D. to Byzantium. In 740 the Byzantine Emperor Leo III successfully defended the city against the Arabs in the Battle of Acroinon. The Seljuks, who conquered the city in the 12th century, considerably extended the fortress, from 1428 it belonged to the Ottoman Empire. Since 1382 Afyon was part of the Ottoman Empire. In the Ottoman Empire Afyonkarahisar was the capital of a sandak, an administrative unit.